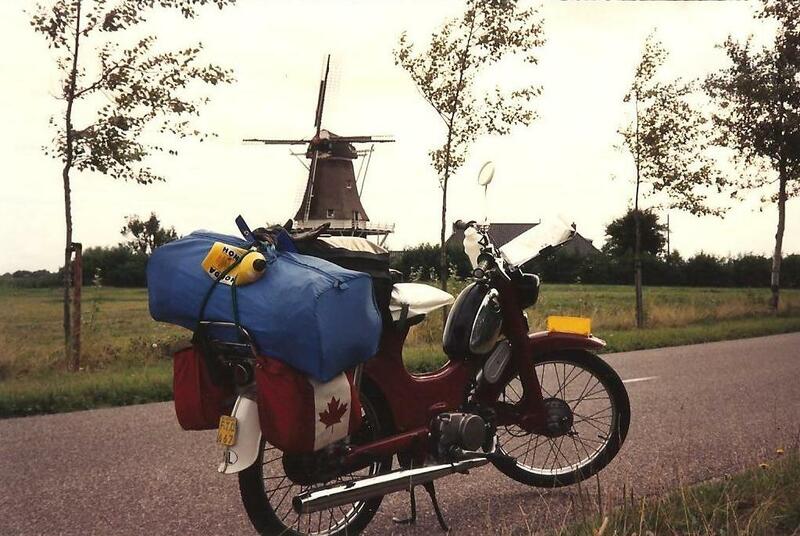 Being a Canadian, living in Holland for a few years in the 1980's and 90's, I wanted to do some fun things that were a little out of the ordinary. This story is one of those things. Do you ever wake up in the middle of the night for no good reason? Well, this time was no different from any other, except I wanted to do something a little out of the ordinary. 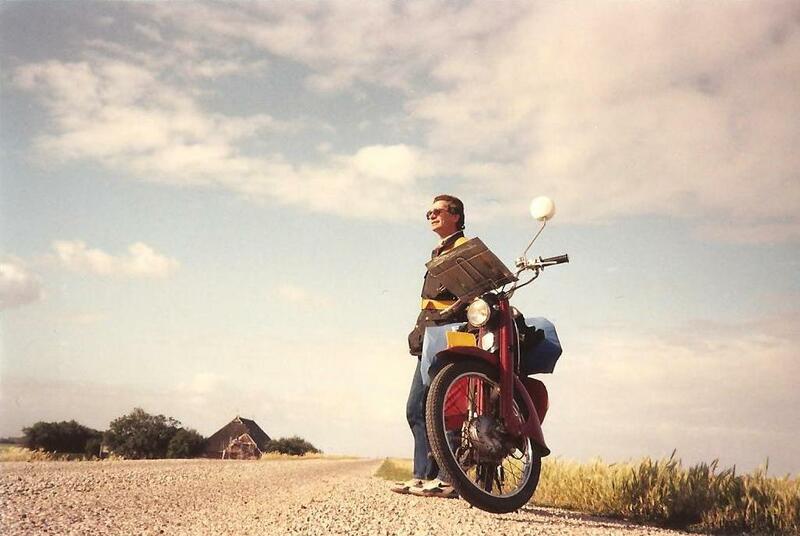 A nice, long ride somewhere, anywhere. As I lay there staring at the ceiling, a plan of riding around the perimeter of Holland started to take shape. I thought of going by bicycle, but being away from home for almost a month didn't sit well. We had a car but what would be the point? Going on bike paths was the most attractive but I wanted to cover more ground than a bike could in a day. I've got it, a moped. Next morning, I told my wife of my idea. Her reaction was to go for it. We talked over what sort of funding was available and spent the next week or so looking at what was available in used mopeds. Armed with the previous weeks data, we (along with our friend Tony) attended the "Oldtimer" show the following weekend at Jaarbeurs in Utrecht. Here, along with some other items, we mulled over some of the used (or as the Dutch call it, tweedehand) mopeds different booths offered. After looking at the usual array of noisy little two strokes,we came upon a 1963 Honda 50cc four stroke. 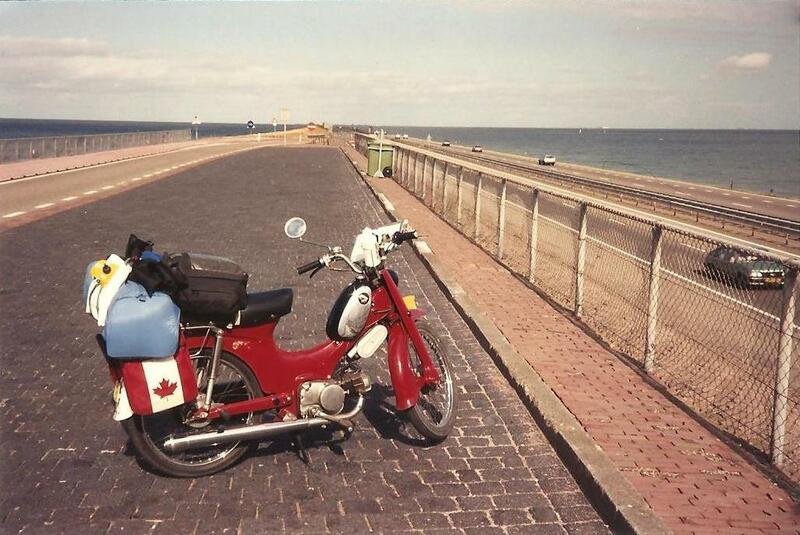 This little bike was very much like the first cycle I rode on in the late 1960's in Canada. The price was right, so it came home in the trunk of the car, well, sort of. It was in both the trunk and the back seat, making Tony's ride back not quite as comfortable as the ride there. I guess that's the price you pay for going along with us to an oldtimer meet. All that next week was spent cleaning, tuning and just getting both Spijk (pronounced Spike) and myself ready for our big adventure. Spijk's name was derived from the comfort range of his poor excuse for a seat. Of course, the spelling had to be that of his home land, so Spike became Spijk. On September 9, 1991, all was ready. I spent the tenth deciding what went where, or what there was room for. On September 11th, after seeing my wife off to work (one of us had to work), I climbed aboard my trusty steed and puttered off toward land's end. My original plan was to run right out to Zandvoort then North but this was hampered by the fact that nothing goes through, not even bike paths. The old "You can't get there from here" routine. Instead, I chose to go through Aerdenhout and Bloemendaal towards the ferry crossing from Velsen to Velsen Noord. Well, the maps I was using were good and up to date but not always accurate. The map showed my turn as being after the train tracks, when in fact, my turn came before. So, to make a long story longer, I took an unintentional tour of Ijmuiden. By now it was starting to rain, so after getting back on track the donning of rain gear was in order. The head winds were also starting to get a grip and little Spijk was protesting by only going 25 to 30kmph. The bike paths are all pretty well marked, easy to find and often run beside well marked roads. The only problems I had were when the signs marking the bike paths were different from those marking the roads. It wasn't always a problem, only where I didn't include or apply the "vandal" factor. Needless to say, I got lost several times. Not hopelessly lost but lost none the less. The path from Egmond to Bergen is beautiful, the way the trees come together above it, giving that "entering a lavish estate" feel. After running through Bergen on the streets, I was switched back to a bike path that drifts away from the road and into the trees. 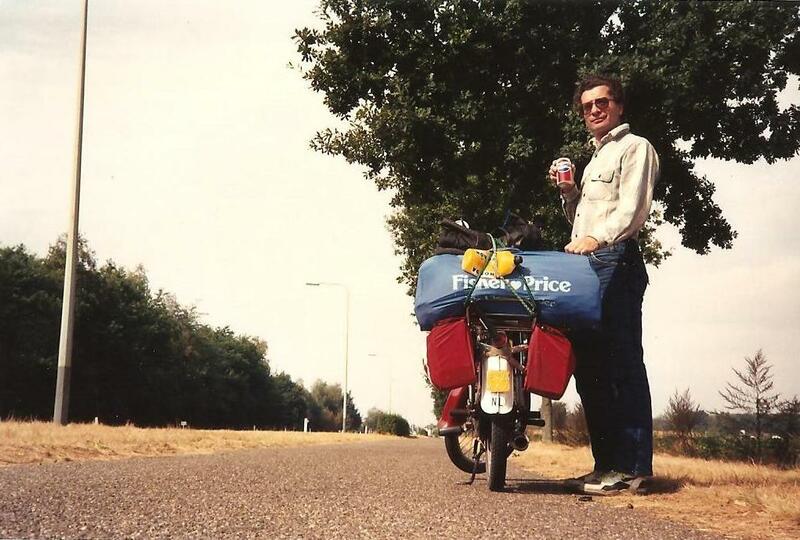 It was a relief to get away from the road as I needed to make a pit stop, Dutch style. You see, here in Holland there are precious few public toilets, instead, what is available are clumps of trees or tall grass and believe me, I wasn't the only one out there using those "lack of facilities". After having a bit of a snack of cheese and crackers, an effortless prod to Spijk's "pedal start" and we were on our way. The bike path from Egmond to Bergen. Stop for snack and to use the "facilities". The wind was getting quite strong as we headed toward Den Helder but both Spijk and I curled down and put our shoulders to it and pushed on. Part way through Den Helder, the horrible head wind turned into a wonderful tail wind. I thought or at least hoped the tail wind would stay with us all the way to Den Oever. Instead, the wonderful tail wind became an irritating side wind and just before the Afsluitdijk, became a head wind again. 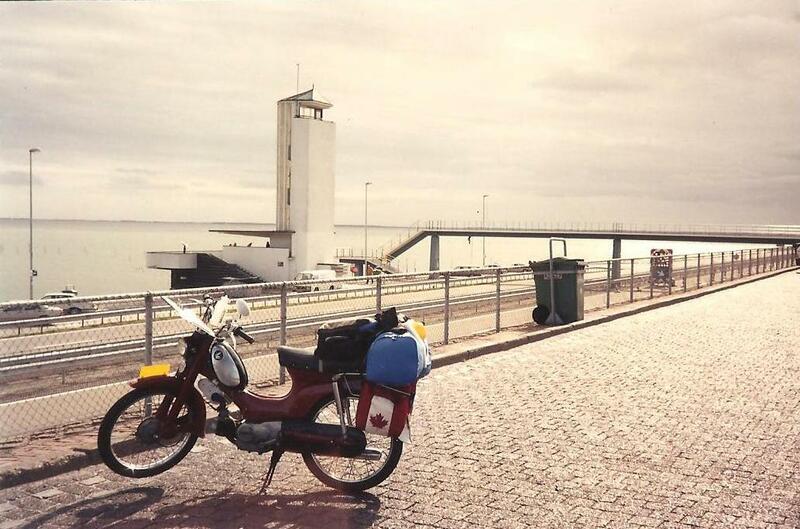 Riding over the Afsluitdijk was quite exciting, not because of the views but because every time I passed a set of locks on this huge dike, the bike path would open to the sea and Spijk and I would get slammed by a very nasty side wind! After the "shock" of the first set of locks, I didn't use up quite so much of the path going past the remainder. Out in the open on the Afsluitdijk. The parking area above the traffic. Looking North on the Afsluitdijk, a long windy way to land! Once we were back on solid land it was getting late, so checking into a camground for the night was in order. I took a run into Harlingen (about 2km) to see if there might be an open store. As luck would have it, there was. In fact, all the stores were open. I guess it was their "late night" shopping day. I had a lot of fun wandering in and out of the shops in this shopping area. Like every little Dutch town, there were canals running by the streets, except these canals were huge by comparison. These canals not only had the usual Dutch boats loitering in them, they also had some very large ocean going vessels to ponder. When the evening shopping was complete, I popped back to the camp site to ready dinner. After the dinner fixings were again stowed, I climbed up and over the dike in time to witness a glorious orange and blue sunset beneath breaking skies. As the sun got lower, all the vessels in the distance became apparent as well as an oil platform. I slept well this first night, sharing my campsite with a curious little hedge-hog. When I woke up to this early Thursday morning, I was pleased it hadn't rained during the night. When the sun started to rise, I found the placement was not the best, as the night's condensation had little chance of being affected by the sun until almost noon. I hate packing up a wet tent. That morning as I ate breakfast, two ducks kept wandering over hoping I would have some bits of food to share. When I thought they had wandered far enough away, I continued with my breakfast. Obviously their hearing is better than I gave them credit for. By the time I was wringing out my tent and packing my little mule, the ducks had given up on me and waddled off to try their luck elsewhere. I would have enjoyed a cup of hot chocolate that morning but with years of neglect of my Primus stove, it got the last laugh this time. I wish our car would go this far on this little gas, 190km on 3.6 liters! I filled up in Harlingen for the day ahead. By 9:00 I was on my way and the sun was starting to warm the day. I followed the roads close to the ocean, some of which appeared to have gates on them. These gates turned out to be what we Canadians and Americans call "cattle gates" or "Texas gates" but in this case, they should be called "sheep gates". Seems to me the sheep spend far too much time on the roads as the roads are just covered with their "business". Dodging said business proved to be unrewarding. As soon as you were able to dodge some, it would only put you in line to run through some. The thing I had trouble understanding was why would it wait until the wheel was most of the way around before it would fling off? This made for some rather interesting riding. First you would dodge some, then you would ride through some but the tricky part was to duck at just the right moment as it got flung over the top. Sadly (for me), I didn't quite master this last step. Above the sheep gates, Spijk and I stop for a rest. The towns along these coastal roads are really cute, they are usually one house deep and occupy only one side of the road. So, you know when you are in town as there are more than two houses in a row. To give the reader an idea of just how small these towns are, the gas station would have one pump, the restaurant would have two tables and the antique/curiosity shop would often have less than ten items for sale. Not surprising, this may all be found in one house! From what I could tell, the houses along here are most often of the old Dutch style, consisting of two to three rooms, not bedrooms, total rooms. From here, I headed south through Spijk (yes, the same as my steed's name), Delfzijl and Wolendorp, veering a bit inland at the German border to spend the night in Winschoten. An old steam engine used as a sign for a machine shop near Spijk. Note the width of the road, barely 2 cars wide. The campground here in Winschoten is rather a nice one. It's close to downtown and most importantly, has a free shower and toilet paper! Truly heaven to a European camper. After the usual tent raising ceremony, I took a walk about the area to see how close town really was. I can truly say that I've not stayed in a more conveniently located campground. Within 10 to 15 minutes walk from my folding abode was the downtown shopping area, including groceries. A little longer walk reaps the sights of a little clump of three beautiful, working windmills. With the sun setting, I headed back to the campground. Dinner consisted of cheese on crackers, four different fruits and a soda pop. After making good use of all the "free" amenities, I toddled off for a very restful nights sleep. The next morning I awoke to the sounds of workers breaking bricks and mixing mortar. Not the most pleasant sounds to wake up to but what I should have expected whilst improvements are on the go. Again, packed up a very wet tent. I just can't seem to pick the right spot to pitch a tent to get the morning sun! Had left over dinner for breakfast, (of which one of the local cats helped me eat) packed up Spijk and waved a fond "Good-bye" to the De Burcht campground. 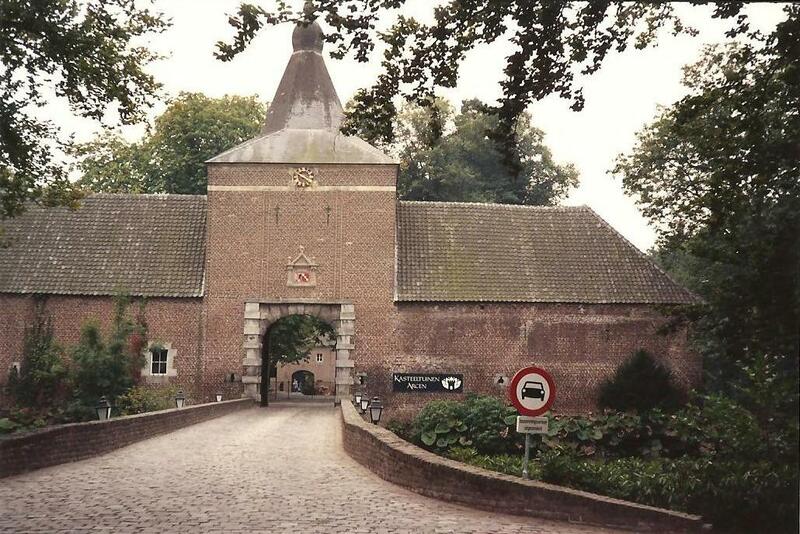 Upon leaving Winschoten, I followed the side roads to Bellingwolde, then continued my quest for roads along the border with Germany. This was a pleasent day for riding, the sun was out and the birds were singing. The day's need for good maps was made apparent by the "wiggly" placement of the German border. I often found myself dipping inland because of either closed roads or the fact they just didn't go through. I popped into Denekamp to load up on some fruits, soda and biscuits. Whilst in the area, I stopped at Huis Singraven. This is a really beautiful spot where once a busy granary flourished. Now a rather lavish restaurant, it still maintains it's mood with the sounds of running water beneath moss covered water-wheels. 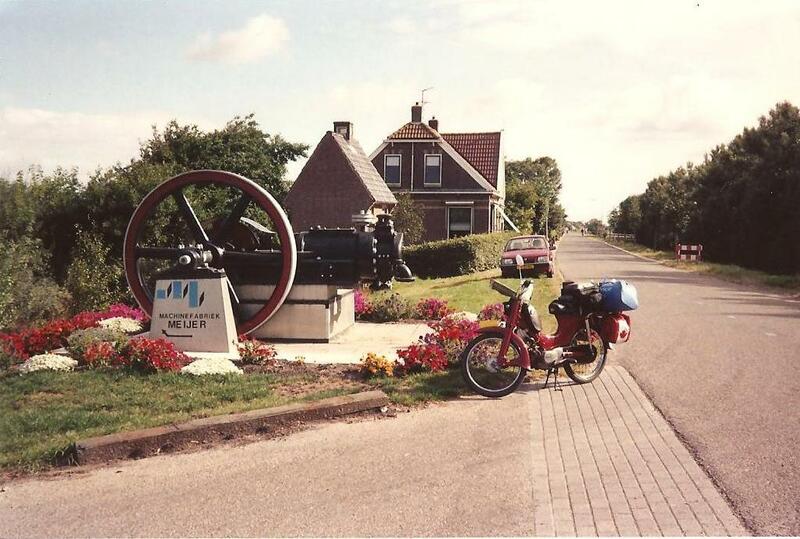 Later, I continued on through Losser, Overdinkel and after gassing up in Glanerbrug, made for the campsite in Buurse. Spijk at the Huis Singraven. The campground in Buurse wasn't close to much of anything but was none the less a pretty nice place. With a price of 6.80 dfl, I was glad to see it had free hot water. After figuring out where the sun was going to come up, I confidently assembled the tent. Because I stopped a little early, the tent could easily dry in the late afternoon sun. The toilets and other facilities were a good hike from where I placed my tent, so I forced myself to stay up late so as not to need to use the facilities in the middle of the night. The next morning when I rose, I found the placement of my tent was once again in the shade! When am I ever going to get it right? This mornings breakfast had a new twist, potato chips. Well, after carrying them in the saddle bags for the whole of yesterday, let's just say they were potato crumbs. After again wadding up my very wet tent, Spijk and I were on our way. It was then Saturday, the sort of half way point in my big adventure. Yes, all was going well, sort of anyway. I had at least gotten used to the "lack" of public facilities here in Holland, in that I'm not quite as bashful about using farmer's fields, bushes or clumps of trees. This trip should really be called "In search of the elusive Dutch toilet". As I was poddering down a little forest back road, I caught up with what appeared to be a very slow car pulling a trailer or caravan followed by a line of about six cars. The road wasn't wide enough for the cars to pass but it was wide enough for me to pass. One by one I managed to wiggle past this slow moving parade of cars only to be faced with the back of the whole problem, a great rolling wall! Being as we were all going about walking speed, I decided to go out onto the grass to pass. After being slowed by a couple of protesting branches, my objective was achieved. I now understood why this "car" was going so slow. In fact it wasn't a car at all, it was a horse pulling a sulky, pulling this huge trailer! I wondered how far they were going, heck, I wondered how far they had gone? 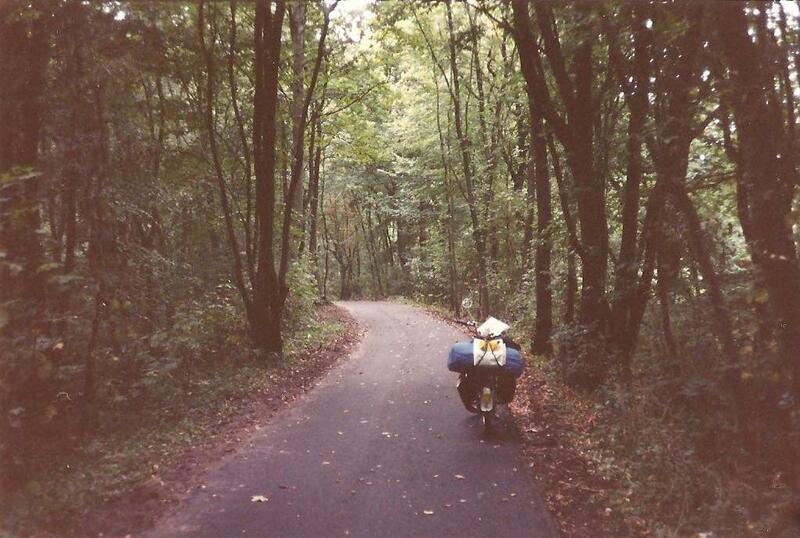 The roads I followed towards Heernberg were what I would term loosely as roads. What they really were, were tracts covered with about six inches of dust, not dirt but dust. Riding little Spijk on this surface was kind of like trying to walk on a greased log. I instead opted to ride on what appeared to be a very narrow bike lane. What made this "bike lane" so very narrow were several wooden posts, (about 6 inches in diameter) that stuck straight up about a foot from the dirt. Bumping one of these posts would have surely put an abrupt end to this adventure. The "Dust" roads towards Heernberg. In the center of Heerenberg, there was this huge castle. At the time of my arrival, was overrun with tourists. I didn't stop. Instead, I just choose to glance over at it while I puttered by. Down the road a piece, I slipped by what appeared to be a toll booth. Well, it wasn't. In my inattention to the road markers, I had just drifted into Germany. With a quick turn-around, I noticed a very well marked turn I was supposed to take. I stopped in Pannerden to buy this weekend's groceries as it was pretty unlikely anything would be open Sunday. After all was bought and paid for, I was loading all my "eats" into Spijk's saddle bags but I couldn't help but hear some kind of fuss going on inside the store. Armed with my poor excuse of Dutch, I could only tell they were making comments about me, Spijk, and the maple leafs on the sides of my saddle bags. A few moments later, the lady that had just sold me the groceries came out to me. "Can you come with me?" she queried. "This man is so hard to talk to!" Seems what was transpiring, was the manager was arguing with her (and now another customer as well) as to what a "bromfiets" was called in English. After I announced the word "moped", a wail of laughter and a stream of teasing erupted from the lady, then joined by the customer, directed toward the manager. Seems the guy was a real jerk and they got in their digs, no matter how small, where ever they could. 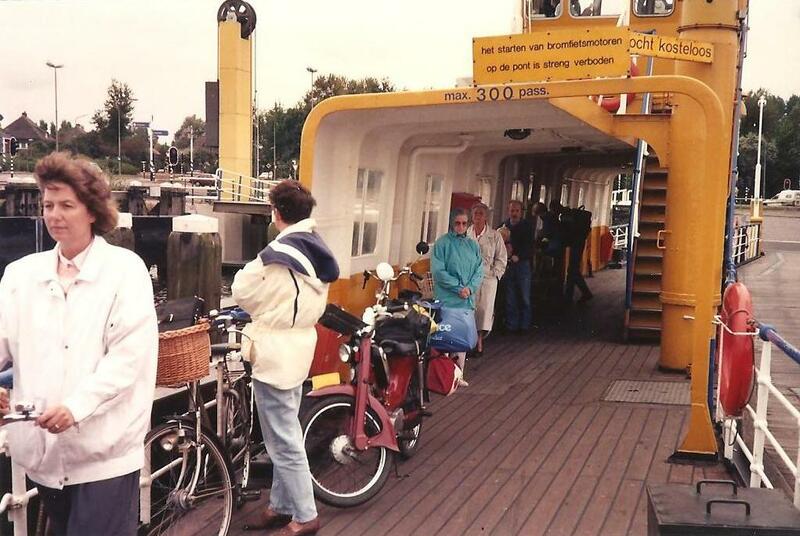 From Pannerden, Spijk and I crossed on the ferry to Doorenburg at a cost of .65 dfl. The ferry was almost all motorcycles and it seemed the motorcyclists were getting their jollies speculating what Spijk and I were up to. 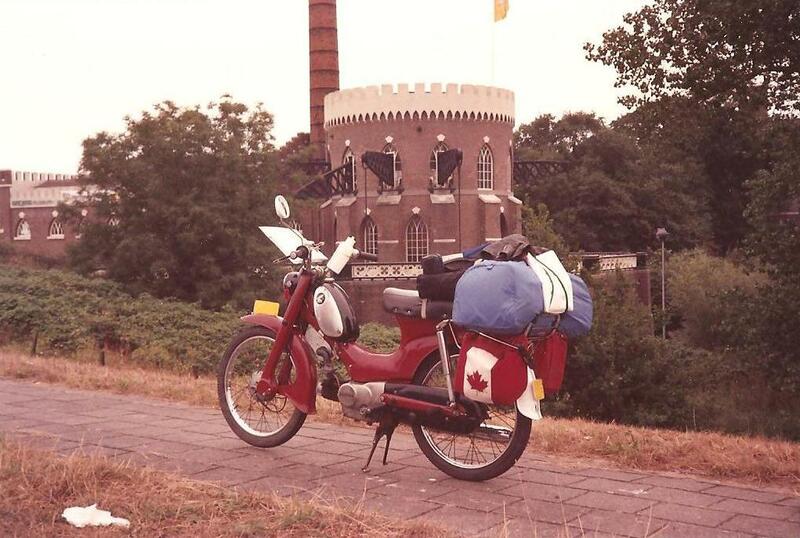 On the other side, we crossed Waal at Nijmegen, following the "rats nest" of roads which was not easy. Spent Saturday night in a campground called "Klein Canada" in Afferden. Being Canadian, well, I just had to see it. It was a nice place, a family resort with activities to involve the whole family. The name, was just that, a name. The free showers and toilet paper were a definite plus! This time, out came the compass, the sun's going to hit the tent this time. I only woke up once that night, that was when the transition from Bingo to dancing took place at 23:00 or 11 pm. 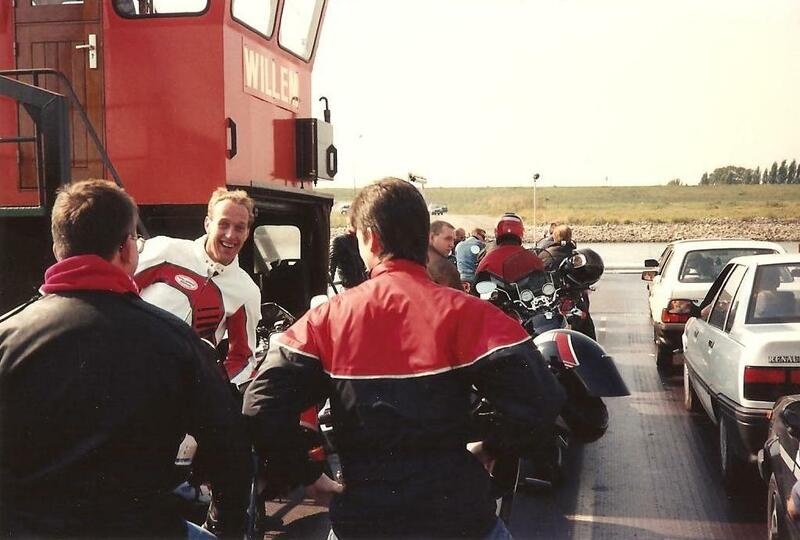 Dutch and German bikers poking fun at me and my mount on the ferry. That next morning I woke up at 7:00, the air was quiet. Something didn't feel quite right. I wasn't sure what it was but, something. When I got up, the tent was dry and the sky gray. Fearing the worst, I broke camp very quickly. As I pushed Spijk up to the bathrooms my fears were realized. It started to rain. Not just rain, it was more like the Gods were dumping buckets down! The rest of the day was spent riding in and out of downpours. I stopped at a beautiful castle but didn't go in, I didn't feel I would be greeted so well in my dripping state. I do hope I can go back to that castle one day, this was Kasteeltuinen in Arcen. This was also where the bike path petered out. The map showed the bike path running beside the road, well, what it did was to take you directly to a farmer's field then stop. I tried to follow some other bike tracks in the mud that kept appearing and disappearing, crossed the same road twice then picked up on a back road that eventually took me to the start of another bike path. I think this is where the saying "Clear as mud" came from. As I entered the area around Epen, the terrain started getting rather bumpy, with hills and valleys that reminded me more of France than Holland. Poor little Spijk was having so much trouble with the hills that at times, it was all he could do to climb to the top in first gear! At one point I was stopped by a couple on bicycles wanting me to show them the way back so they wouldn't have to climb any more hills. Kasteeltuinen Arcen. It may not look it but it's pouring rain! After getting to the top of one very long hill, I came across a tiny fruit stand. The old fellow there was very glad to see me, glad to see anybody I expect. I bought a number of items, some of which he suggested. My charges came to a whopping 3 guilders, amazing! As he saw me on my way, it again started raining. The occupants of four cars that chose to stop whilst I was there were all now trying to huddle under his little make-shift roof. A little further down the road it was time to make a pit stop. Just rounding the top of a hill was an old burned out mansion, so I pulled in. Even after fire had wreaked havoc on this once stately structure, it saddened me to see it left to the highway vandals and the elements. When I arrived in Maastricht, I found the only way to continue in Holland was to go back over the Maas river as the city is surrounded on three sides by Belgium. So, after a little loop through town, I crossed over the Maas river and continued my journey. The day was getting late and it was again raining, so when I saw a camp ground with a cafe as well, I just had to stop. Putting up the tent in the pouring rain is an experience I could have done without but there weren't a lot of options. Once the tent was up, I dashed over to the cafe for some grub. You can understand my surprise when I was told they weren't serving food today. An open cafe NOT serving food? Amazing. With tears in my eyes and hunger in my tummy, I dashed back over to Spijk to see what I had to eat. Rummaging through my food stores, I found just enough to fill the gap until tomorrow, leaving just enough to make a small breakfast. If the weather was a little better or if I didn't have to be so careful about not getting wet, I would have liked to walk into Brommelen to see what it was like. It wasn't a very restful night. I woke up about 1:00 to heavy rain and a wet spot developing in the bottom of my sleeping bag. The next morning came very early. I climbed into damp clothes, as well as my rain gear followed by eating a soggy, cold breakfast. Wringing out the tent and sleeping bag in the pouring rain just didn't feel like the proper way to start the day. When breakfast was through, Spijk and I were once again on our way. We headed up through Elsloo and Stein, crossing the Maas yet again at Maasbracht but only after watching the ships and barges being raised 22 meters at the Maasbracht locks. A trip through Holland without a photo of a windmill is like, well, a day without rain! I stocked up on food at the market in the town of Baarle Hertog. The town and market were situated in such a way that when I left the store on Spijk, I had already passed my turn. I sort of made an unintentional visit to Belgium. After getting back on track, the day's ride was spent pretty much in the rain, again. The time to set up the tent and climb into a wet sleeping bag came all too soon. When Spijk and I arrived at the Zundert campground, there was a car-load of Polish girls waiting for someone to arrange accomodation for them. They could wait in their car out of the rain, I on the other hand didn't have that option. When someone was finally raised to come and help us, the rain was starting to run down my arms and into my gloves. Because the Polish girls were ahead of me, I was given sufficent time to ponder the advantages of renting a cabin whilst they argued about prices. After the Polish girls had stomped out in search of another campground, I went for it and got a cabin. Wow, four beds, four chairs, a table and yes, a propane stove! Splurging 44 guilders, there was room for everything to hang up to dry, at least until morning. The feeling of being warm and cozy with a hot chocolate in hand whilst the rain was pouring down was truly ecstasy. While going out for a walkabout, I was approched by a resident of the campground and asked to join her and her husband for a cup of coffee. With a certain amount of hesitance, I thought, "Oh, what the heck" and joined the walk to their trailer. Upon arrival, introductions all around were hampered by their very excited dog. I didn't really hear their names and I don't suppose they heard mine but we all enjoyed each other's company none the less. After several cups of coffee and stuffing myself with several biscuits, I got back to the cabin at 22:00. What a feeling, I woke up the next morning to find all my gear was pretty dry. It was breezy outside but the clouds were breaking up. After a leisurely breakfast and three hot chocolates, Spijk and I were off to see what adventures lay just down the road. Almost every town I'd visited on this trip was either having a parade or some kind of festival. It's very hard to get through the towns when this is happening as the through streets are usually all closed, but after getting a good night's sleep and not having to wait for things to dry the next morning, I was able to get going early. I was able to see a few towns before the streets were filled to overflowing. 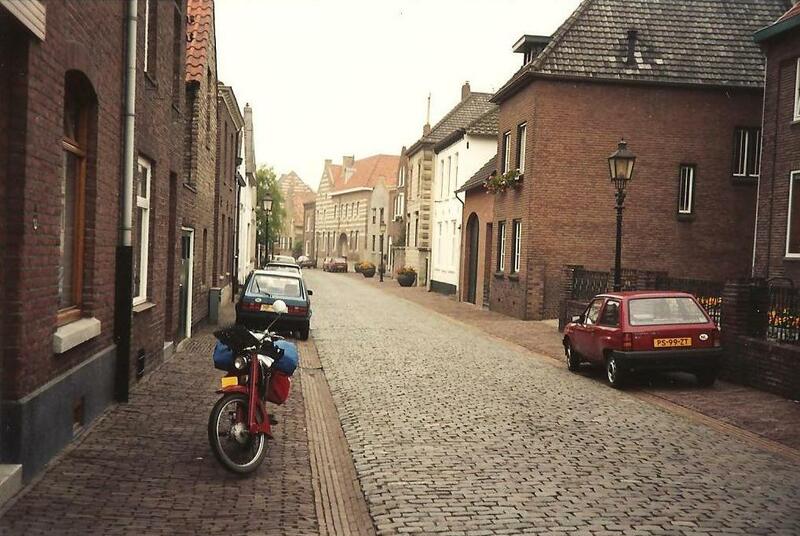 Typical main street in a typical Dutch town, at least before the parade begins. 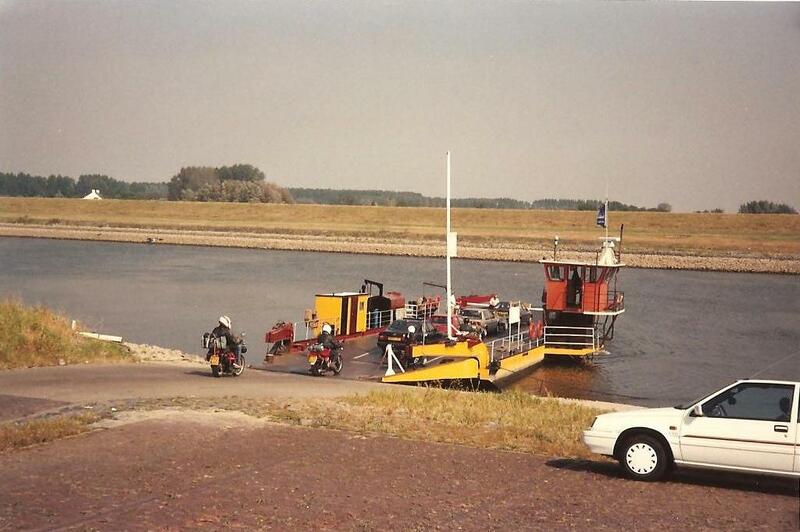 In order to go through the bit of Holland at the bottom, it is necessary to take a ferry ride from Kruiningen to Perkpolder. This ferry is a rather large one. I compared it with those to Vancouver Island from the mainland. You say you've never seen those, eh? Well, they are about one third the size of the Koningin Beatrix, (the ferry that goes from Rotterdam to Harwich, England). I was caught very much by surprise that if you walk,ride a bike,or ride a broomer (moped) you got on free. The trip over to Perkpolder was a little rough as there was a rather good side-wind. I, having the cast iron constitution of a "real" traveler, was glad the trip only took twenty minutes. 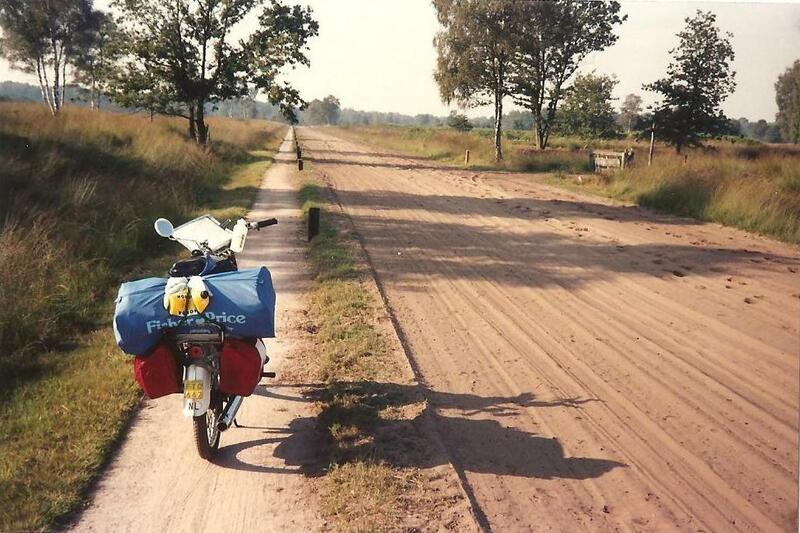 Once back on good old "Terra Firma" I found my maps didn't cover this portion of Holland. So, after arriving in Hulst, I bought another map to add to our collection. Zipping across the bottom and popping up to Breskens only took about three quarters of the day, so I jumped on to the ferry to Vlissingen. After walking Spijk across the locks in the Vlissingen harbor, I found the town of Vlissingen hard to get out of as every direction the bike path took us was all torn up. Playing motocrosser through all these construction zones on eeny-weeny Spijk was not a lot of fun. It was starting to get late in the day, so Spijk and I started looking for a campground in the Domburg/Oostkapelle area. After getting the shock of twenty guilders for a simple camp site, I decided to keep on riding. 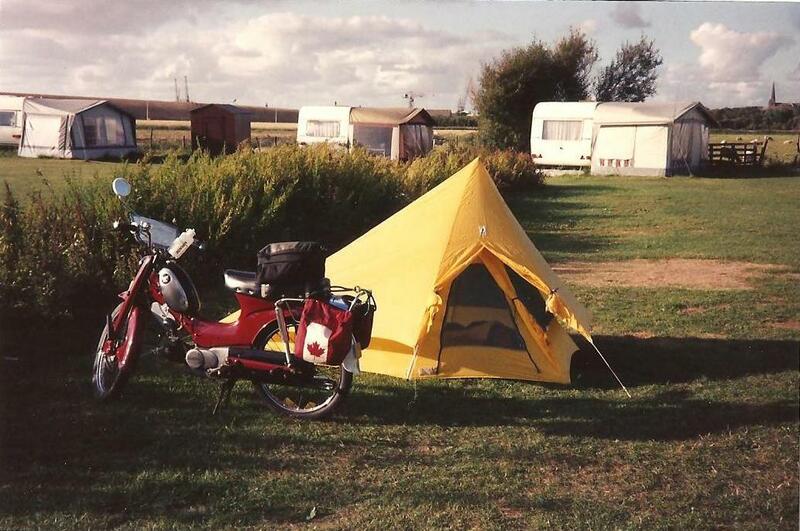 It wasn't until we crossed the Oosterscheldekering that we finally found a campground of a decent price. The sun was going down as I put up the tent. After dinner I went for a walk into Burgh-Haamstede. The walk didn't last long as it was full dark and the cars were having trouble seeing me. I bought a shower for .60 dfl and went to bed feeling very refreshed. Enjoying a warm soda outside Domburg. The next morning the sun was out in all it's glory, only one problem, the place where I was instructed to put the tent was surrounded with hedges. Yup, you guessed it, pack the tent up wet again. From here it was just a matter of crossing two dikes and I was back on the mainland. Dipped around the corner to Oostvoorne, took the ferry across to Maassluis (at a cost of .60 dfl ) and ran straight out to the coast of Hoek van Holland. From here I was able to successfully follow the bike paths through Den Haag and over the sand dunes to Katwijk and Noordwijk. Here it was necessary to go inland a bit as the bike paths didn't go any further. 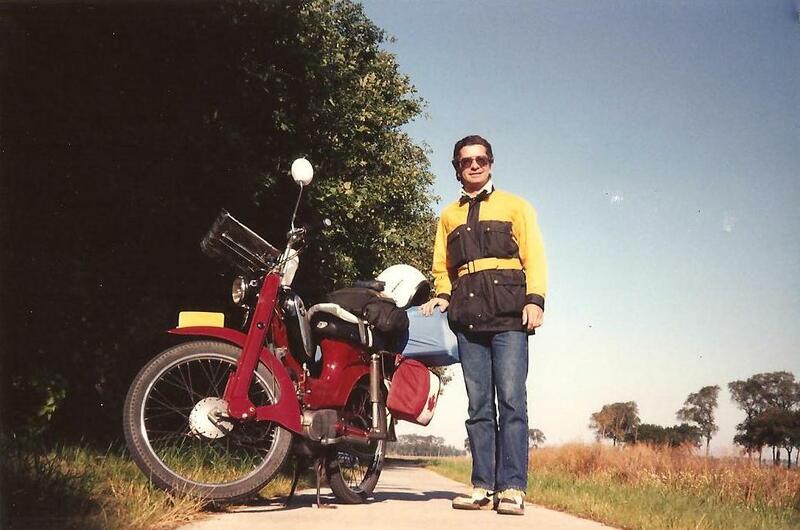 I followed the side roads to Heemstede and the N-201. As I started to enter familiar territory, I spent time thinking about the sights and people I'd seen and met on my great adventure, most of which I would never see again. Only one regret, time, not allowing myself enough. Looking back, I wonder how much time would have been enough? Two weeks, three weeks? I guess it will be a long time before I really decide. After jumping onto N-201, for some reason I was no longer in a hurry to get home. "Just a little longer" I pleaded but it wasn't to be. 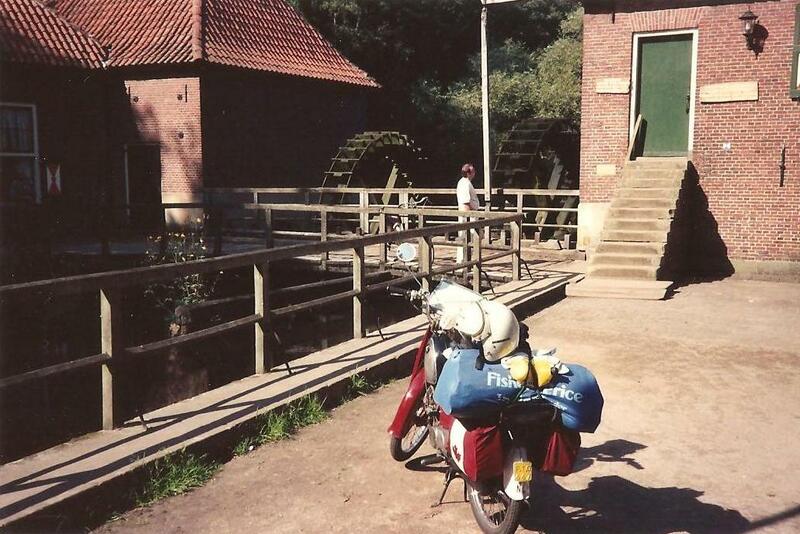 From here, past the Cruquius pumping station, through Hoofdorp and home, bringing my pint-sized adventure to a close. A total of 1600 kilometers in eight days. The Cruquius pumping station, now being restored. It's the only one left of five that were used to pump water from the huge polder where Schipol Airport is now located.